Sukkot is a joyous holiday packed with prophetic significance. Our tradition teaches us that a time will come when all people will come up to Jerusalem to worship HaShem on Sukkot. This is the climactic message of the Haftarah read on the first two days of Sukkot from Zechariah 14. But the connection between the nations and Sukkot does not begin in the Messianic Age. Rather, the connection between the two goes all the way back to Mt. Sinai. The Jewish people are called throughout the Torah to be Or l’Goyim – a Light to the Nations. From the beginning, God’s desire to reconcile humanity back to God’s self is mirrored most vividly in our Festival of Tabernacles. After all, HaShem’s desire has always been macro – to reach all of humanity, beginning with the Jewish people. Among the numerous offerings prescribed by the Torah during the Biblical seven days of Sukkot, seventy bulls were to be offered corresponding to each of the seventy nations of the world (see Gen. 10). According to our rabbis, this was a prophetic act of intercession on behalf of the nations. So even within the Torah, we get a small glimpse of God’s compassion and concern not just for Israel but for the nations as well. Although the context of Revelation 7:9-17 may not specifically be related to Sukkot, it does contain many of the themes and imagery related to Sukkot, and echoes language from the Torah and Haftarah readings. This imagery is right out of Zechariah 14 when all the nations of the world will come up to Jerusalem, carrying their Lulav and Etrog, singing Hallel, and dressed in their finest attire. 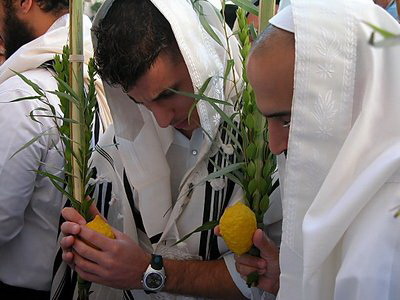 Sukkot is also known as Chag HaAsif, the Festival of Ingathering, because it is a prophetic allusion to a greater time to come. One day, the Jewish people, alongside the nations of the world, will come together in Jerusalem to ascend the Temple Mount singing and waving the Lulav and Etrog together in praise and adoration of our LORD and King. One day we will see the Lamb, our righteous Messiah, and will be caught-up together in heavenly ascent. As we celebrate Sukkot this year, I pray we will all experience a taste of the World to Come. Maranata – Come Adon Yeshua, speedily and in our day! This entry was posted in Uncategorized and tagged Holidays, Hoshanah Rabbah, New Testament, Sukkot. Bookmark the permalink. Baruch Hashem, may we all be blessed with the living waters of Mashiach on this days and for all the days to come until his return. Maranata! I must say that I’m completely chagrined. Somehow the details and significance of Hoshana Rabba completely went over my head up until now. I even wrote about simchat beit hashoevah; the joy of the water-drawing, a few days ago, but never realized the connection and that what was sealed on Yom Kippur is delivered on Hoshana Rabba. It is clear that I have much to learn. Chag Sameach. Those further connections with Hoshanah Rabbah are indeed intriguing. Hope you’re having a wonderful Chag!